When you take any word in English and count its letters, then count the number of letters in that numeral and so on, you'll end up at 4. Why is that? In English the word four is the only numeral that has the same number of letters as its number value and there are no endless loops between numerals. It turns out that this works in several other languages as well, including Dutch, Estonian, German and Hebrew. In some languages like Italian or Croation 3 is the magic number and in some languages it doesn't work at all. In Spanish for example you may end in an endless loop between 4 (quatro) and 6 (seis). Head over to Everything is 4 on marijn.org for more details on several languages and a form where you can enter a word and see how it eventually leads to 4 in English, 3 in Italian and so on. I learned about this yesterday via Today I Learned, a place where knowledge that is fascinating and of questionable value at the same time is shared by the community. 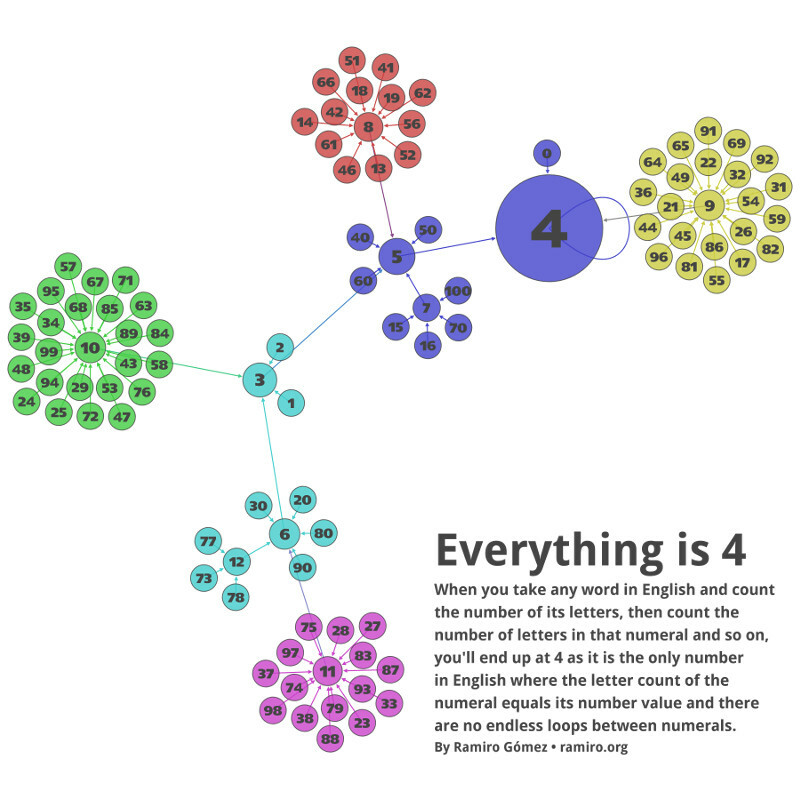 The linked post by Matthew Henderson features a graph showing the paths that lead to 4 for the numbers between 1 and 99. Having a soft spot for graph visualizations I was intrigued by this and created the graph you see above. It shows the relationship between numerals and their letter counts for the numbers 0 to 100. I created the graph with Gephi using a ForceAtlas layout to position the nodes and the PageRank algorithm to scale them. That's why 4 is the biggest circle. The colors show the communities in the graph determined by their Modularity. No matter where you start, every path leads to the number 4. The graphic is available as prints in several sizes from Redbubble and Zazzle. This post was written by Ramiro Gómez (@yaph) and published on July 13, 2015 . Subscribe to the Geeksta RSS feed to be informed about new posts.